Today, Victoria attended the conference titled Agenda 2030 in downtown Stockholm. This conference focused on what Sweden can do to help reach the global goals that the UN set in September. These 17 goals that they hope to reach by 2030 are goals that strive to improve inequality, poverty, hunger, and strive to sustain and protect our planet. For this engagement Victoria wore some of what have been her staples throughout her pregnancy. She chose her black and white geometric Asos Maternity dress. Over this she wore her Seraphine Black Peplum Blazer (Currently out of stock). 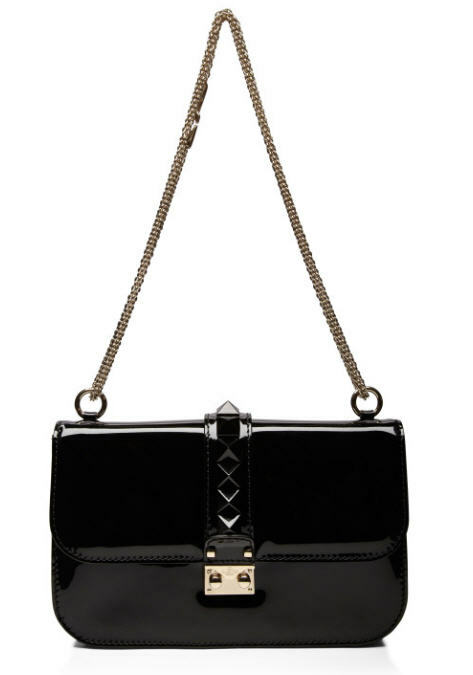 She chose to keep with the black theme by selecting her black Valentino bag. It also appears that she is wearing a new watch instead of her trusty Epoch watch which was a gift from the court about 5 years or so ago. I must be honest- my first reaction to the photos was- "Holy Bump!" Victoria has really popped- I am pretty convinced she is going to give birth near Estelle's Birthday- I really don't see her holding off until March! The next time you will here from me is most likely Thursday when Sofia has her first engagement of the year. Until then- have a great week! BUMP!!!!!!!!!!!!!!!!!!!!!!!!!!! I hope the Estelle doesn't share a birthday with her little brother ;) that will be too much! You got to space stuff out a bit.......... Not that the Sweds know how to do that, Royal Wedding, two days latter Royal Baby, then pregnancy announcement, christening, pregnancy announcement and now 2 royal babies a month apart!! and that all in how many months? 9-10 months from when the 2 Royal baby is born! But I do hope the baby comes sooner rather than latter, cause I want a Royal Baby!!!!! and then it would be nice if Sofia kept her bun in the oven for a bit so we can enjoy the little guy, before we have another little princess to coo over..... plus I would much rather have 2 christening, opposed to a joint one, so the farther apart the better. Also can't wait to see Sofia's Bump the week!!!!!!!!!!!!!!!!!!! I think we will be saying "Holy Bump!" with her as well! Hahaha- Gert your comments always make me smile! I bet Sofia will have popped a bit as well but no where near Victoria's-- I was not expecting it to be so big today!! It was a nice surprise to wake up to a picture that Heaven sent me!